Labs can spend hundreds of thousands of dollars on an elegant instrument -- for example, a scanning tunneling microscope (STM) or an atomic force microscope (AFM) -- yet the quality of the data depends on the probe. 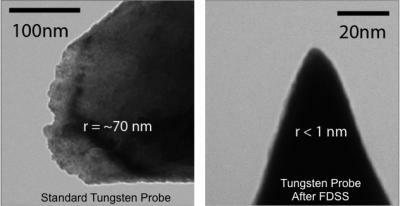 Probes can degrade rapidly with use, wearing down and losing resolution. In such cases, the researcher then has to stop the scan and replace the tip. But once the probes are ultra-sharp, what's to keep them from wearing down just as quickly as other probes? Lyding and Schmucker then teamed with U. of I. chemistry professor Gregory Girolami and materials science and engineering professor John Abelson, whose groups had demonstrated coatings for silicon semiconductors made of a material called hafnium diboride. The coatings are 10 times harder than the metal usually used to make STM tips, but are also metallic -- the key property for the ion-sputtering process.